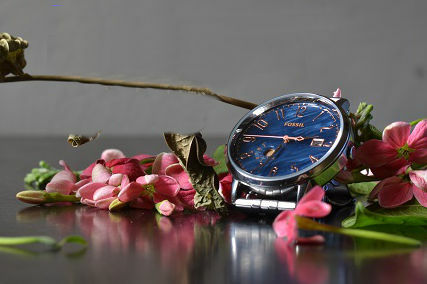 Have used a vintage watch to depict old times, extremely dry leaves, and somewhat fresh flowers. Intention was to show increasing age with time. 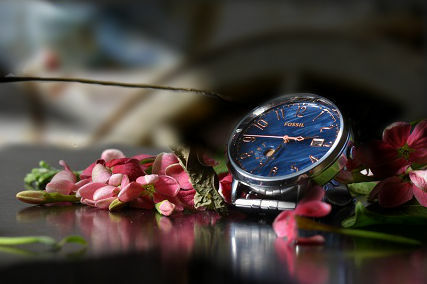 I have kept watch out of focus so that it doesn't seem that this is an advertisement of watch. Some people have complained that it is looking as if I want to show off the watch. 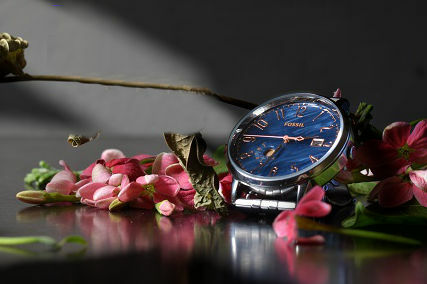 How to improve the composition of this scene with watch, flowers, and leaves such that it depicts time's effect on age? Your metaphor is okay but here are a few observations. Pictorially, in our culture, time flows from left to right in the same direction as we read. Similarly, it flows from the background into the foreground. Upper-left is "older" than lower-right. Using such cultural cues, you can show time flowing or ebbing to suit the story. Mixing new with old breaks the flow. It becomes a still-life composition. We compare the objects chosen for the arrangement. Sharp focus determines our point of interest. By focussing on the watch, it becomes the "product." If it were in the background it would become an accessory. Obscuring objects diminishes their dominance. The presence of a watch suggests "hours" and "minutes." A pendulum clock suggests "weeks" and "days." For some reason depending on the source, twenty minutes past eight o'clock is a popular arrangement for analog time-piece "hands." Possible signs of age: Patina, rust, dust, spider webs, brushed off paint on edges, scratches... Making the photograph black and white, sepia toned and with shallow depth of field mimicking old large format cameras might also help adding some impression of age. In my opinion the composition is "too posed"
It is set on an environment where you would not see a watch and you would not see a plant. Think on how a real night table would be, how some real flower arrangement would be, and how it would decay. Then imagine you find that, which was already worth of photographing, but now you have a nice composition that looks old. Edited... Well this could be a matter of style, but here I go. 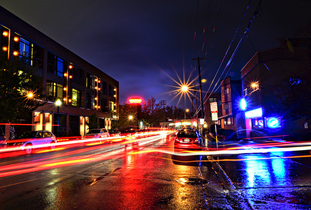 2) Play with the light! Use some snoots! Give some personality to the background with the light. Give the photo a mood. 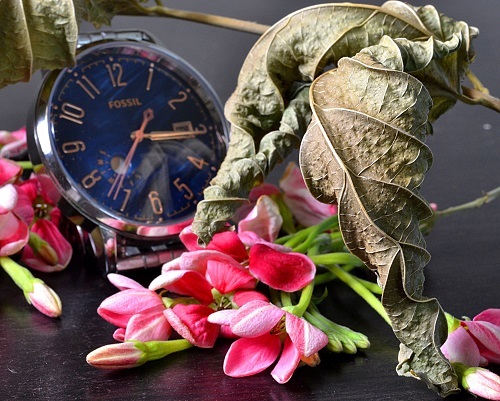 I think you are too focused on the concept (a watch and dry flowers) and you are not seeing the full picture. Subject+Light+Framing+background+mood. How about adding a substantial amount of dust to the face of the watch? This would be similar to making it out of focus to help deemphasize it as the subject (a product photo wouldn't be dirty), but also makes the watch look older, and show it has participating in the passage of time. If you are looking to make the leaves look old then i think they need to be darker. 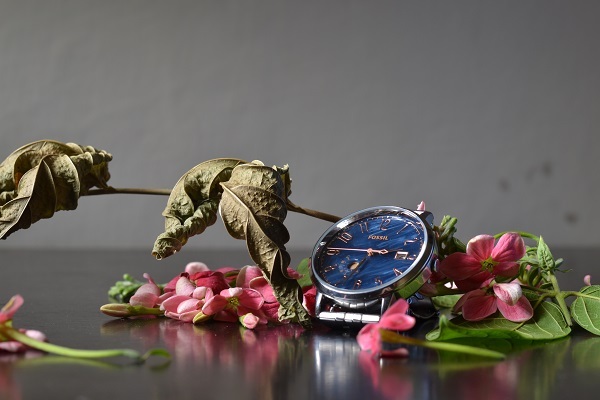 I think the lighting should focus on the watch and the leaves a darker point. Brightness makes things look more "alive" if you will. 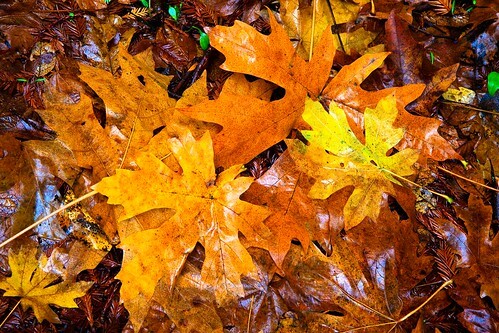 So the leaves, although dead, look very much alive to me. Here's an example of what i mean. 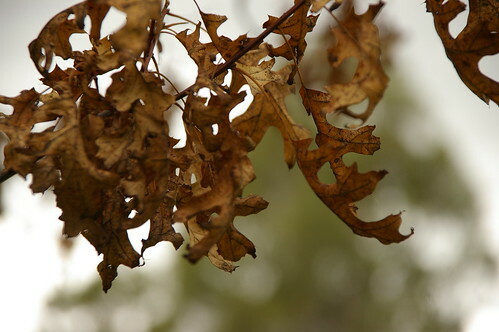 These leaves look very much dead because of the black spots, the brown tone, and there dark color. These leaves on the other hand are equally dead but feel much more alive because of the brightness and highlights of the photo. Not the answer you're looking for? Browse other questions tagged composition still-life symbolism or ask your own question. How can I improve the composition of my food photos? How can I control figure-to-ground composition when I can't stage the whole scene? How can I improve the composition of this photograph of a lake and structures off of its shore?